My painting of a vintage reamer - done on canvas. Artist hardboard or stretched canvas? For the most part I prefer to paint on hardboard. It is smooth and slippery, providing a perfect surface for my painting technique. I do choose to paint on canvas on occasion though. I have to adjust my technique slightly when painting on canvas because no matter how smooth the canvas seems, it still has texture. It also moves or bounces because it is stretched and has some "give" to it. The reason it has texture and movement is, it's a woven fabric. There are two types of canvas; linen (hemp or flax) and cotton. Linen is a higher quality material and was the fabric available for the earlier artists. It is probably preferred by many professional artists today as well, especially oil painters. Cotton duck canvas stretches easier and has a tighter, more even weave with less texture to try to cover. It is also less expensive to produce, and therefore more readily available at the basic art & craft stores making it widely used. Sails are constructed in cotton canvas and so are many tote bags. Before paint goes on a canvas it is covered in a medium called Gesso which fills in some of the texture and prepares the fabric to receive the paint. Most of the canvas that we find in art stores today are primed with a couple of coats of Gesso making it paint ready for the artist to take home and begin painting. Although many Artists prefer to begin by covering the already primed canvas with a coat of their favorite brand of Gesso or a sealer. Hardboard requires priming (or preparation) as well. When you find it in an art store it will commonly have a few coats of gesso on too, making it white on the top painting surface, and brown everywhere else. Depending on the manufacturer/distributor, hardboard can also be found unprimed, in it's original brown color and in need of priming or prepping. Either way artists will generally add a coat or two of their favorite gesso or sealer before painting. The Renaissance painters went to great lengths to be sure that the canvas they used was texture-free to achieve their Realism paintings. For them, preparing the canvases could take weeks or months until they got the smoothness they needed. If you visit Museums and look closely at the old masters works sometimes it is very had to tell that it was canvas they were painting on. Recently while studying an old painting in a museum I read the caption stating that the artwork was painted on canvas and I couldn't believe it. It was so smooth it left no impression of being fabric. I marvel at the precision of Realism the early painters achieved in a time when there wasn't any photographs to rely on. Which brings me back to why I prefer art-board! Although I can in NO way put myself in the old masters league of painting, I can relate to them in the preference of smoothness in creating my Realism. 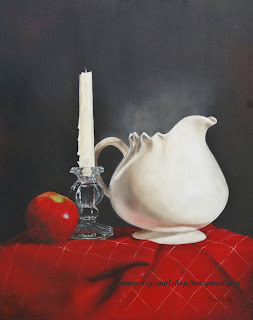 For my painting Red Cloth Still Life, my favored hardboard provided an extra smooth surface. The elements in this painting were smooth and polished; a crystal clear candle holder, a gleaming white pitcher and a shiny apple are more realistic because I didn't have to fight the texture on the painting surface. A textured surface can be advantageous if there is texture in your elements. In my painting Vintage Juice Reamer, the dimply orange was accomplished much easier due to the texture in the canvas. However the gleaming knife and the rounded glass of the reamer was more of a challenge. If you click on the image above, you can actually see the canvas texture in the photo. So, hardboard or canvas? It's really about personal preference, so you choose.